This is a map of Census tracts in the Capital Region core. The deeper the color, the higher the median age. A bonus graph of the Capital Region core's population age distribution. The age group with the most people in the 2016 estimate was age 20-24 with 8 percent of the overall population. Maps and a bonus graph are at the top in large format -- click or scroll all the way up. The numbers are from the US Census Bureau American Community Survey 5-year estimates for 2016. So they're a little old. And the numbers are estimates with margins of error, so grains of salt and all that. Also: We divided the map by Census tracts because we think those better approximate neighborhoods than ZIP codes. + The two Census tracts with the highest percent of people 20-40 were the the tract along Quail Street in Albany's Pine Hills neighborhood and the tract that includes Washington Park and Center Square. That Quail Street tract ranked #1 for both percentage of population 20-40 (73 percent) and estimated total count of people 20-40 (3,708 people). + Four tracts in Albany that are adjacent to the those two tracts all ranked in the 10 top. And the city has multiple other tracks that rank in the top 25. 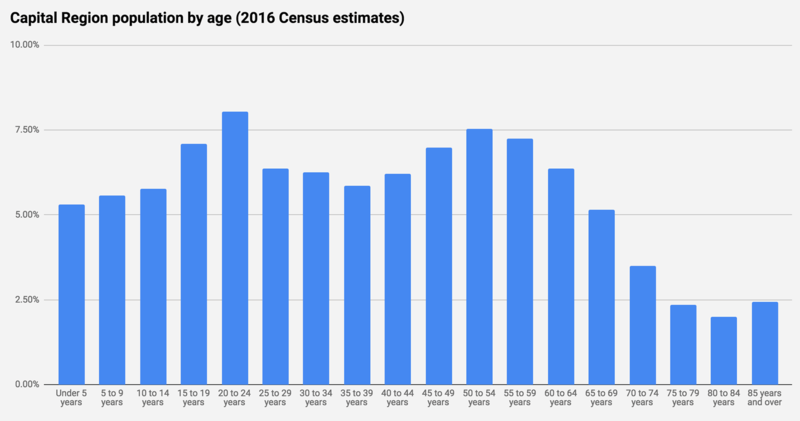 A bit that maybe a little surprising to us: The local Census tract with the third highest total number of people ages 20-40 was the one that covers the northern end of the city of Rensselaer. A third of its residents -- 2,329 people -- are estimated to be in that age range. 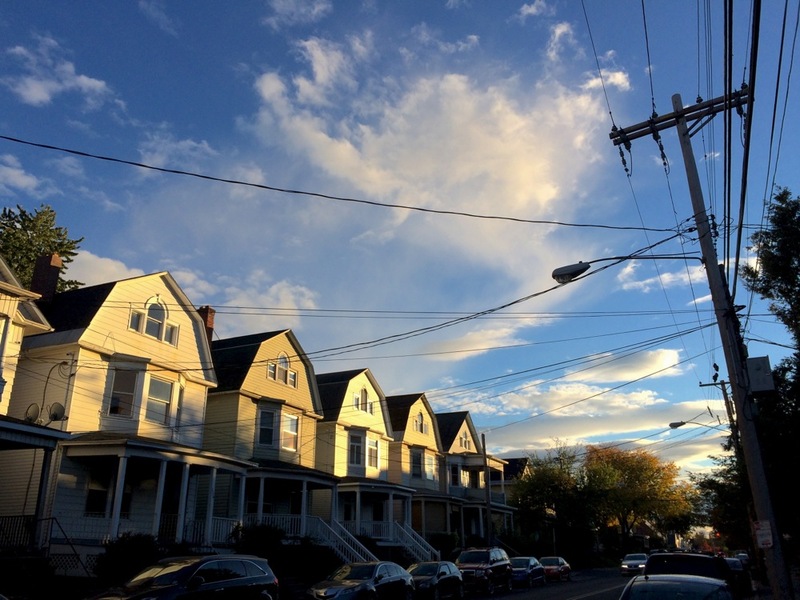 Something that will jump out right away when you look at the map is that the Census tracts with the higher percentages of people 20-40 often are in the Capital Region's four core urban centers. 1. Millennials are a huge group of adults. At this point, when you say "Millennials" you might as well say adults 40 and under because the oldest members of the generation (depending on how you define it) are now in their upper 30s. 2. Many of them are choosing to live in suburbs! So, sure, places like the heart of the city of Albany and downtowns of Troy, Schenectady, and Saratoga Springs have high percentages of people in their 20s and 30s. But there are also clusters in Guilderland, and Colonie, and Menands, and Halfmoon. The "Cities? Suburbs? Yes." alignment is playing out nationally, too. Just a reminder that's worth being cautious (or maybe more specific) when talking about trends. An geographic-demographic quirk: The Census tract with the youngest median age in the Capital Region is the one that covers most of UAlbany's uptown campus and the adjacent SUNY Poly campus (median age 19.7). The tract with the highest median age is the one right next in the Pine Bush that includes a bunch of retirement homes (median age 63.8). As is often the case, All Over Albany does a better job at delving into the statistics than the so-called mainstream media. I think few millennials really want to live in suburban apartment complexes - in this region or elsewhere. The only thing that people really like about those places are the easy parking.